This symbol, a bicycle and the German word "frei" meaning "free" or in this sense "permitted", is seen frequently in Muenster. This sign is used where other forms of traffic may not be permitted, but bicycles are. 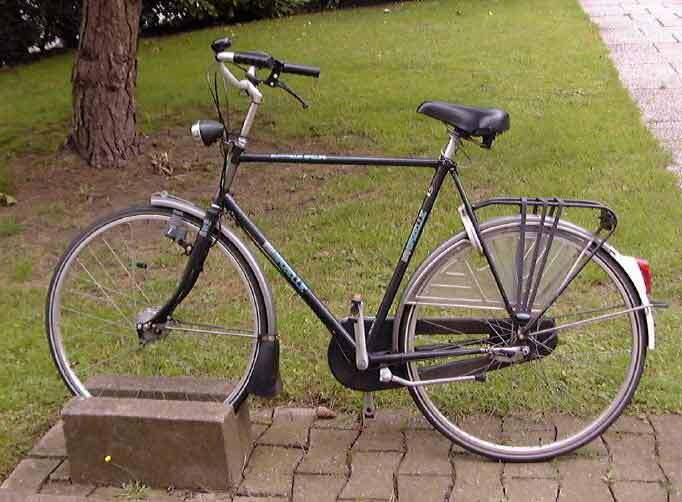 While on sabbatical at the University of Muenster during spring semester 2000 I almost exclusively used a bicycle for transportation around the City of Muenster. The extensive network of bicycle lanes and paths and the courtesy shown to bicyclers by drivers of motor vehicles was most impressive. I live on Long Island and regularly commute to SUNY Stony Brook about six miles from Port Jefferson where I live. Most of the roads I travel on are relatively narrow with no bicycle lane. They also have quite heavy traffic even though they are mainly through residential areas. Bicycling paths or lanes are rare along the major roads on Long Island. Courtesy towards bicyclers is common on Long Island. One often, however, gets the feeling that some drivers would rather bicyclers did not exist and often act as if bicyclers were invisible as they drive too close to you, pull out directly in front of you or pass and make a right turn across your path as you enter an intersection. Muenster did not become a bicycle friendly (fahrradfreundliche) city by accident. During World War II the city center was almost completely destroyed. In the reconstruction of the city after the war it was decided that bicycles and buses should be an important part of city traffic. For the past 50 years the city has continually worked on increasing bicycle use. One argument those opposed to investing in bicycle lanes and paths in the United States use is that the lanes and paths will only be used during the day in good weather during the summer months. Thus, they are not worth the relatively large investment. The use of bicycles in Muenster shows that if the use of cars is discouraged and if well maintained and safe bicycle paths are provided, bicycles are used throughout the year, in inclement weather and at night. Muenster is located in north Germany where rain is common. During the winter it rains almost every day, but if one wears appropriate rain gear one stays reasonably dry. 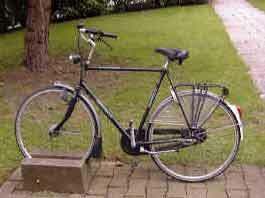 Also, the type of bicycle most commonly used in Muenster is not designed for speed or off road use. It is designed for city travel and to keep water spray off the rider. I found that typical speeds are 9 to 12 miles per hour (15 to 20 kilometers per hour). Click on photo to get a larger image. 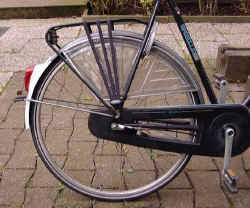 These are photos of the 5-speed Gazzelle bicycle I used in Muenster. It is quite different from the 15-speed road bike and the 18-speed hybrid bike I use on Long Island which are really recreational vehicles. The bicycle shown here is a commuting bicycle. The handle bars are set high so that the rider is more upright. To prevent spray from getting on the rider, there are fenders on both wheels, a mud flap on the front fender, a plastic covering on the rear wheel and complete covering of the chain . The bicycle also comes with a front wheel generator that supplies electricity to a halogen head light and to a red rear light. The front wheel brake is an enclosed disk brake. The rear wheel has a coaster brake. 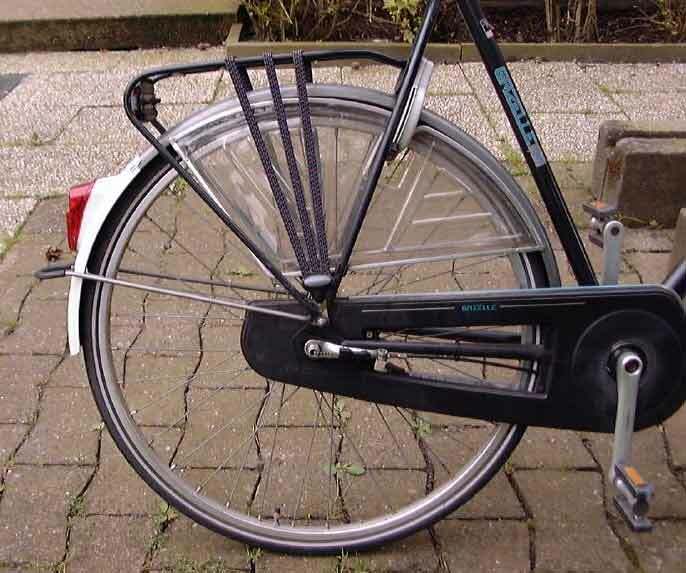 Also, it has a built in lock on the rear wheel. Click on photo to get a larger image. Why should a city or suburb encourage bicycle use? The following sites have extensive links to sites that encourage the use of bicycles as a mode of transportation. Critical Mass is a monthly bicycle ride to take back the streets from cars. Commuting - Everything you need to know to prepare yourself for commuting to work or school. What does a city need to do to encourage bicycle use? Muenster is in the state of North Rhine-Westphalia in western Germany. North Rhine-Westphalia is making a concerted effort to encourage cities and communities to become bicycle friendly (fahrradfreundlich) through laws that encourage bicycle use. See the description below. The following comments are excerpted and directly quoted from a report "FHWA Study Tour for Pedestrian and Bicyclist Safety in England, Germany, and The Netherlands, October 1994"
Except for the pictures with attribution the photos were taken by Gilbert N. Hanson over the period January through July, 2000. My comments are in italic. Bicycling is a frequent activity in Munster. About 43 percent of trips are by bike and 48 percent are by car, which is a very high percentage of bike travel compared to most German cities. * Bicycle: 72 people are transported on 72 bikes, which requires 90 square meters. * Car: Based on an average occupancy of 1.2 people per car, 60 cars are needed to transport 72 people, which takes 1,000 square meters. * Bus: 72 people can be transported on 1 bus, which only requires 30 square meters of space and no permanent parking space, since it can be parked elsewhere. Photo is from "Program fahrradfreundliche Stadt Muenster"
Cycling education is given in school starting in kindergarten at age 3. These courses are taught every year by the police, and children are tested at age 9. 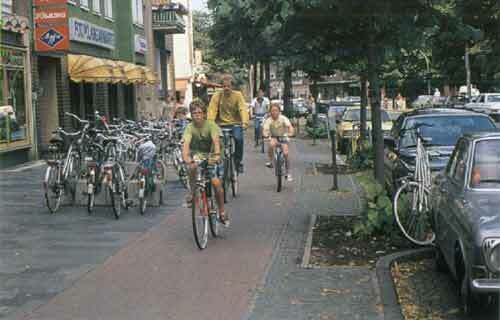 Children age 8 (as of 1997 it is now age 10) or younger are required to ride on the sidewalk in Germany. 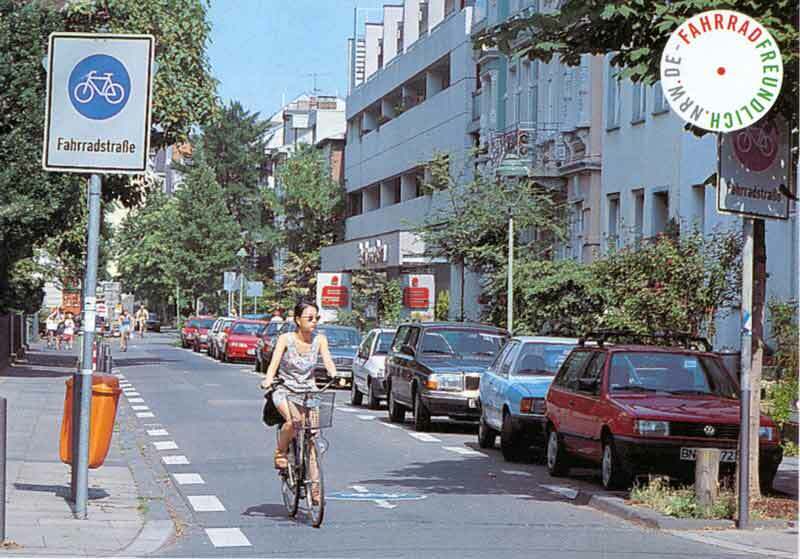 "Radfahrerfreundliche Altstadt" (Trifold brochure) Bicycle Friendly old city (or City Center). Die Radstation Muenster (20 pages) A booklet giving a history of parking at the main Railroad station, a description of the services and facilities at the 3000 bicycle parking garage, and plans for enlargement of the garage. The following were published by the Arbeitsgemeinschaft Fahrradfreundliche Staedte und Gemeinden in Nordrhein-Westfalen with the Ministerium fur Wirtschaft und Mittelstand, Technologie und Verkehr des Landes Nordrhein-Westfalen Some of the following information be found at their website at http://www.fahrradfreundlich.nrw.de/ However, it is in German. 3) establish clear political priorities for the use of bicycles for transportation. "Fahrradfeundliche Staedte und Gemeinden in Nordrhein-Westfalen - Eine Zwischenbilanz" (145 pages) An interim report that describes the efforts in each of the cities and communities participating in the Bicycle Friendly (Fahrradfreundlich) program. Well illustrated with photos and diagrams. 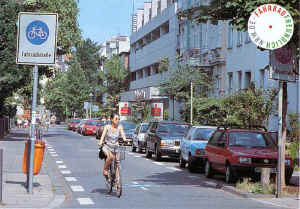 The following brochures publicize and describe the German Government's 1997 Road Traffic Act (StVO = Strassenverkehrsordnung) which encourages bicycle use through clearer bicycle lane markings, establishing bicycle streets that are primarily for bicycles on which motorized vehicles may be permitted, allowing one-way motorized vehicle streets to have bicycle lanes with bicycles traveling in both directions, allowing bicycles in bus lanes and allowing bicycles on some footpaths. 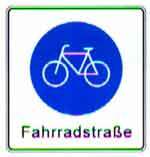 "Einbahnstrassen - Frei Fahrt fur Radfaherer" (1999, 12 pages) One way streets - bicycles permitted to travel both ways. Describes when it is permissible for bicycles to travel both ways on one way streets. 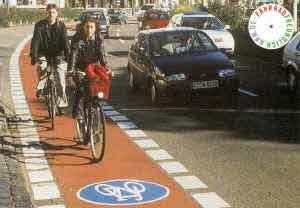 "Fahrradstrasse - Radfaher sind hier tonangebend" (1999, 12 pages) Streets meant primarily for bicyclers. Cars may use these streets, but must give bicycles the right of way. Even if there are no bicycles on the street they must travel at moderate speeds. 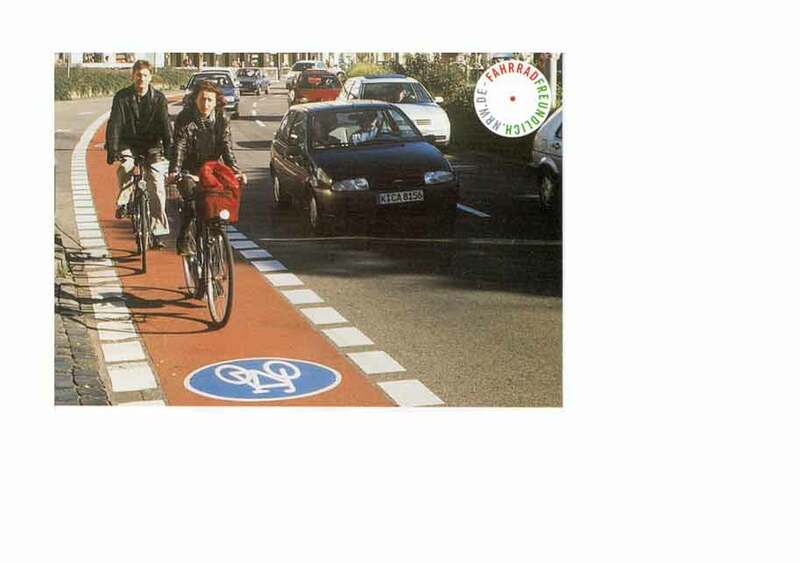 "Markierungen - mehr Platz - mehr Komfort - mehr Sicherheit" (1999, 12 pages) Markings - more place - more comfort - more safety Describes the different kinds of bicycle lanes, how they are marked and their relation to auto traffic. North Rhine Westphalia that are Fahrradfreundlich. Map from "Fahrradfreundlich mit Rad and Tat fur eine neue Mobilitat in unseren Staedten"
Photo from "Markierungen - mehr Platz - mehr Komfort - mehr Sicherheit"
Photo from "Fahrradstrasse - Radfaher sind hier tonangebend"